Travellers going to Boracay coming from Caticlan Airport can take a 5 minutes ride by tricycle to Caticlan Jetty Port (100PHP). Travellers going to Boracay coming from Kalibo Airport will have to take a 1,5 to 2 hours ride to Caticlan Jetty Port. 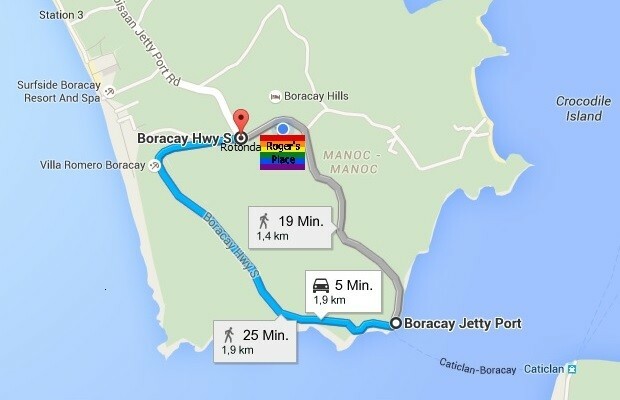 When arrived at Cagban Port in Boracay you can take a tricycle to get inside the island. Tricycles leave when fully loaded with 7 passengers (30PHP) or you hire a tricycle individually just for yourself (150PHP) to bring you straight to Roger’ Place. Tricycles may only take the clockwise direction as shown with the blue line in the below map. You need to get off the tricyle at Rotonda. Walk straight ahead, after 200m walk up right the steeply rising street until the end (100m). Turn left and walk the pathway which is not cemented to Roger’s Place (100m). Just follow the signposts of Boracay Eden Villa, which is our neighbor. 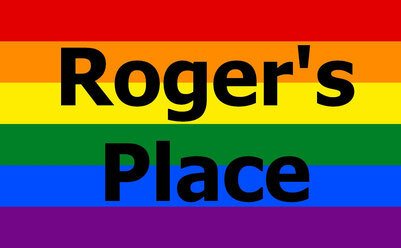 If you take a individual tricycle it will bring you straight to Roger’s Place. Tell the driver Boracay Eden Villa (our neighbor) or Beth Shalom Academy (Well-known school around the corner) – They will know! 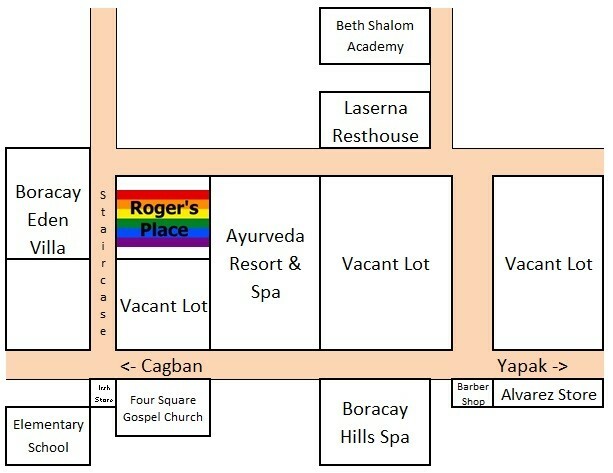 Just follow the signposts of our neighbour Boracay Eden Villa! We do not guarantee the above made price quotations! This should just give you an orientation what is the normal pricing. -so better negotiate your price before you take any services! · If it’s your first time in Boracay and you are not familiar with the Island we can also just pick up you at Cagban Port and bring you straight to Roger’s Place.